Here’s the catch: You MUST show you used your canes in another piece / project order to qualify for the prize. If you would like other caning tutorials, here are several of my favorites with tutorials here on KatersAcres. NOTE: Many canes are very detailed and complex. Many canes are simple and striking. You do NOT have to be a master caner to participate. If you need an easy idea, make a simple leaf cane (as Lisa presents in her book or here from my tutorial) and add it to some fall decor. For the month of October, you must complete no less than one project by making a millefiori cane and using it in a subsequent project. To be entered to win a prize from Lisa, you must post your photo in the Facebook Group, in the October Album. If you are not a member yet, please join the group here. You can find several easy millefiori cane tutorials here on the blog, in addition to the canes featured in Lisa’s book. CLICK HERE to see them. Your choice of polymer clay (amount and colors of clay needed will vary depending on the cane being made, its complexity and theme. Raffia ribbon – You don’t need a lot of ribbon for this project, approximately 20-24 inches depending on how you will tie your ribbon. Wash & clean your mason jar to get any “film” off the glass. I used an old soft toothbrush with some Dawn dish detergent on it. Make sure your jar is completely dry. Take your lace & wrap it around the rim of your mason jar. Trim so that the edges will just overlap. Place small “dots” of hot glue around 1/4 the rim. Quickly (before it dries) attach the lace. Do this three more times, until your lace meets the end where you started. NOTE: Please know that when you place your jar into the oven later, the hot glue will remelt and will soak into the ribbon causing a “glossy” effect, but it will also more permanently adhere to the glass. For this reason, do NOT “blob up” your hot glue. TIP: Be sure that the place where the lace overlaps looks neat and tidy. I used this portion as the “back” of my design, later in the process. Because each of us may choose to make a different cane, instead of a direct tutorial, I will post process pictures of the cane that I chose to make with steps to make a similar flower petal cane. Please do not follow these steps if you are making your own cane using Lisa’s book, one of my cane tutorials, or a tutorial from another cane you’ve found online. I chose to base my cane off of the cane presented on page 48 in Lisa’s book. Being familiar with caning, I changed and altered my design from the original design Lisa wrote about in her book, making it more like my Reversible Cane – Get the Tutorial here. Choose & condition the clay you will need for your cane. Begin with a Skinner Blend Plug or Skinner Blend Bullseye Cane – Get the full tutorial here. Here’s the steps I used the make the first portion of my cane. You will see that to make the petals of my cane, I deviated from Lisa’s book, using my own pattern, the Reversible Cane here. Once you have your petals, you can follow the steps in Lisa’s book to make smaller full flower canes by reducing, slicing the petal canes into sections, and packing with additional clay. I chose not to do this because I wanted stand alone, large flowers. Remember that this is your cane and your project. Only you know what you are making and what results you are looking for. Follow your instinct and see what happens. When the petals were done, I needed to make a leaf cane. I modified this simple leaf tutorial by adding a skinner blend in the middle and colored vein lines. I used only scraps to decorate the bottom and top side of my mason jar. 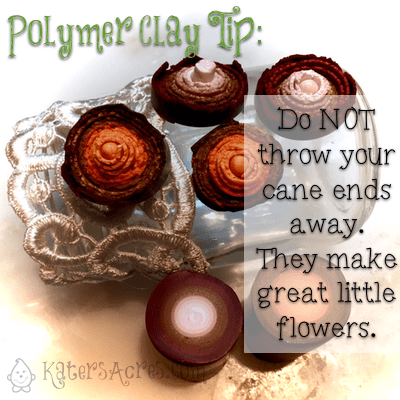 Remember that there is NO WASTE in polymer clay. Learn to transform your scraps into something else. Assemble your flowers by cutting your petals as evenly as possible. Assemble your flowers in a pleasing pattern. I wanted a single layers of petals only, but you could arrange more as shown in this tutorial. Add some glitter or hot fix crystals in the center of the flowers for added pop. Add metal rivets to the flowers to make a nice, clean hole to string your flowers later on. This way if you make too many, they can easily transform into gorgeous polymer clay flower pendants for some easy fall necklaces. Bake all your component pieces for 45-60 minutes at 275 degrees fahrenheit (if using Premo! polymer clay). Once everything is baked, it’s time to assemble your pieces. First gather, measure, & trim the appropriate lengths of raffia ribbon you will need. Use additional raffia ribbon to tie onto charms you created. Tie your raffia ribbon around your lace on the top of the mason jar. Add a flower here and there into the knot of your raffia ribbon. Finish with a big bow. Display as your fall centerpiece on your dining room table, mantle, or fall arrangement. Use your leftovers and make some fall pendants for yourself or your friends (see the photo at right for how I used my “left-overs”). Tie off with simple hemp, cotton, or leather cording, and add some wooden beads for a rustic, simple & natural look that is perfect for fall. FRIENDLY REMINDER: At the request of many, I have been trying to keep my tutorials extremely basic to allow you a jumping off point. Please note that Lisa’s tutorials in her book are highly detailed and offer many variations. In addition, any of the technique based projects we do can be adapted to many different types of claying from jewelry making, sculpture, organic components and so many more. Lisa & I put this project together so that people could grow in their love of clay and maybe learn a few new things along the way. Yes, there are many artists in our group who have skills of a master clayer, there are also those who just picked up their first block of clay last month. Be patient. Be encouraging. And NEVER give up! Hi Katie, nice to see you using my Teardrop Blend in your tutorial. Glad to see you like it so much that you’re sharing it with others!